Rather simple, but reliable and economical methods of simulating casting processes ensuring production of castings with a minimum number of defects at the stage of mold filling with molten metal have been developed. Key words: molten metal, casting, casting defect, gating system. For the first time ever, a process of manufacturing high-quality large-size (up to 5 t) parts by the IC method has been developed. Key words: investment pattern, casting, computer simulation, prototyping. Muller W. Corrosion when Using Water-based Lubricants in Die Casting Impact of a lubricant applied to the diecasting die surface on corrosion processes is shown. Modern water-soluble lubricants allowing to reduce that impact are proposed. Key words: die casing, release lubricant, die, corrosion. The article describes a process of making porous Al alloy castings by impregnating them with a water-soluble filler by vacuum suction, and gives a comparative characteristic of porous cast aluminum and sintered bronze filter elements. It is shown that cast porous aluminum is by all parameters superior to porous products made by the powder metallurgy method. Key words: porous metal, chill mold, impregnation, filler, filtration. The mold’s resistance to erosion can be adequately evaluated by the formula of noneroding melt speed. It follows from the formula that the uniformity of binder distribution over sand grains has a decisive effect on the degree of sand mold surface erosion. A method of determining the uniformity coefficient Go by the lost on ignition is proposed. A method of molding sand preparation by settling the binder on sand grains allows to considerably increase the Go. However, a cardinal method of preventing sand contamination in castings is to wash sand molds with a special anti-erosion coating. Key words: erosion, disintegration, sand contamination, sand wash, binder, mold wash, coating. Monastyrsky A.V. Modern Methods of Developing and Optimizing the Manufacturing Processes in the Foundry Industry One of the most effective measures for cutting production costs, improving products’ quality and competitiveness is computer simulation of a process instead of full-scale experiments. Only half of a dozen of foundry process simulation systems available in the world market are being used. The article presents some most important moments that must be taken into account when choosing a system and adopting it at a foundry. Key words: computer simulation, mathematical model, casting, gating system, defects. 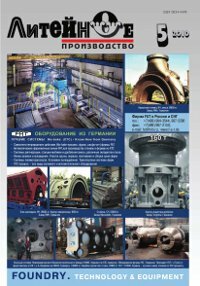 The author convincingly shows that the E.N.Budanov’s article gives a comprehensive analysis of modern world experience on innovative sand form molding processes for a faultless choice at modernisation of foundry productions in Russia. 25 years of operational experience of V-process molding line in Kurganmashzavod has proved that the vacuum technology is effective, harmless and recommended for modernisation of foundry shops. Keywords: modernisation of foundry production, choice of a form production process. In the article the mistakes are shown, which are used by opponents of Greensandprocess in comparison with No-bake-process. Huge volume of casting output in the world automotive industry produced on automatic moulding plants using the Greensand technology, especially the innovative Seiatsu-process, is an indisputable proof of advantages of the Greensand-process for corresponding types of castings, excluding extra large ones because of flask size restrictions in the moulding lines. Keywords: modernisation of foundries, a well-founded choice of technologies and the equipment. Quartzite – one of the polymorphic modifications of silica – is used as a basic lining material for induction melting furnaces. The article discusses conditions for successful operation of furnace lining, characteristics of new materials FINMIX, FINRAM and others produced by the concern SP-MINERALS OY (Sweden) are given. Key words: induction furnace, polymorphic transformations, lining, refractoriness, slag, porosity.